Enterprise SEO marketers developing a global footprint see tremendous value in global SEO. Targeting greater performance from global search engines is a top priority for enterprise search marketers since it is a gateway to increase leads, conversions and revenue. Successful global SEO can translate to even greater marketing ROI since extending SEO success to global markets can be built on the reuse and repurposing of existing investments in people, content and best practices. Marketers need a global, connected approach to SEO marketing to realize these benefits. What exactly does global SEO mean? Global SEO involves targeting customers internationally via the many global search engines. Depending on which countries you’re targeting, you may need to create copy in multiple languages and take into account regional dialects and colloquialisms when performing keyword research. Many companies are moving toward global SEO — ranking in global search engines is becoming a greater priority for 63% of marketers in 2013, compared to 2012. While the emphasis on global ranking is welcome, I would like to remind marketers that global SEO is ultimately a means to the one exalted goal that every SEO marketers should strive for — delivering the most relevant and seamless user experience to each user, regardless of location, language and search engine. 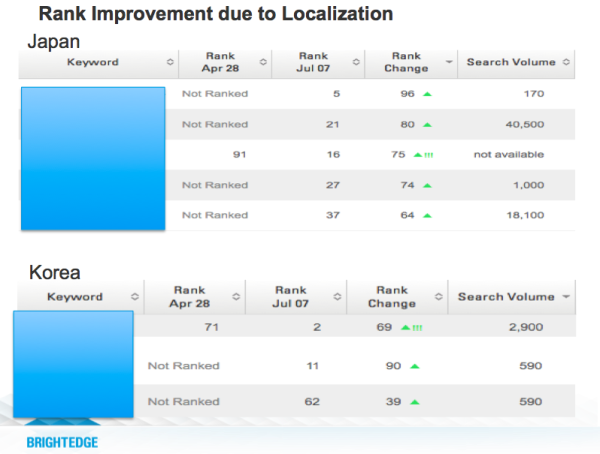 In other words, global SEO success requires localization excellence, and that is the topic of my post. Before I dive into the topic of localization, I want to clarify that both local SEO marketers and global SEO marketers should care about localization. Whether you are purely focused on search engine rankings in the two cities of Los Angeles and San Francisco or attempting to rank across the USA, Canada and Mexico, localization will be of interest to you. To be sure we are all on the same page with respect to global and local SEO, I would recommend reading this article, which describes how the nature of your business, the geographical footprint, and the type of offerings you sell influence what strategy you need to pursue. Ultimately, delivering the right content to your audiences everywhere is your gateway to success. Localization addresses this imperative, and here are a few best practices. And all this while translating just one line of the ad copy — imagine the potential for mistakes while translating entire pages of Web copy! If localization is not translation, then what is it? It includes a number of steps that apply the scientific rigor of research and analysis deployed to rank in your primary market. It employs the core activity of translation supported by an awareness of what is appropriate in the language, geography and culture of your target audiences, in addition to the topics that really matter in their context. Thorough research, analysis and testing should be the core of every SEO project. As always, answer the following questions for each combination of geography and language. What topics matter to my audience? How are these interests expressed in the form of phrases/keywords? How do these translate into search demand? Can you zoom in on head and tail terms (and groups)? Who is your competition for each combination of language, geography and search engine? What keywords is your competition focusing on? From which sites is your competition getting their backlinks? Are these sites relevant to your business? Does it make sense for the users of these sites to see a link to your content? Can your target keywords be incorporated into existing content that you intend to reuse? Be sure not to force these keywords into the content. If not, plan on creating new content. How does the audience for each combination consume information? What formats do they prefer (example: text vs. visual)? Do you have a plan to create content that maps with these formats? What emotions and values are taboo to your audience? The list is endless, but the goal is the same — the message should be delivered in a compelling, and appropriate manner that will deliver the most relevant and seamless experience to the user. You may have noticed that the data- and culture-related steps above do not include two important elements: the localization workflow and the resourcing to execute these tactics at scale. I deliberately did not include these elements because workflow and resourcing are so heavily dependent on the organizational structure of your company that any advice on that front would have to be customized for it to be applicable. Due to localization efforts, global results show a significant in-country ranking increase for relevant, in-demand, and optimized keyword-driven content. The ranking increases below (with a corresponding conversion increase) highlight the value of addressing market opportunities when introducing new global content. Click here to view full presentation of “Global & Mobile SEO Strategies” from BrightEdge Share13.